Anadromous Fish of the Columbia River Basin - SOTSP. The anadromous species of particular interest to the Columbia River treaty tribes are salmon and steelhead, Pacific lamprey, and white sturgeon. These species share a common anadromous life cycle, yet differ in specific life history details and requirements. The evidence available suggests that salmonids appeared between 20 and 100 million years ago, and have evolved in the Pacific Northwest over the last 10 cycles of glaciation (Stearly 1992). There are five species of salmon prevalent in the Columbia River Basin. These include chinook (Oncorhynchus tshawytscha), coho (O. kisutch), sockeye and kokanee (O. nerka), chum (O. keta), and steelhead and rainbow (O. mykiss). Chinook, coho, sockeye, chum, and steelhead are anadromous species the adjacent Figure 3.2; kokanee and rainbow do not migrate to sea prior to sexual maturity. Adults of all Columbia River salmon species die after spawning, except for steelhead which may spawn more than once. Predominant life history characteristics, such as areas required for spawning and rearing, timing of adult migration back to spawning grounds, and number of eggs produced for each of these species are provided in Table 3.3. All of the salmon species, including steelhead, may be divided into three basic life history types for the purposes of description. The life history types of salmon are stream, lake, and ocean, referring to where the young reside at the end of the first year of life. Chum salmon and the fall race of chinook salmon are ocean type, in which the young enter salt water some time during the year following their deposition as eggs. A typical ocean type, taking the fall chinook salmon for example, starts life as an egg in the gravel of the Columbia River above Richland, Washington in October, emerges from its gravel nursery in February or March, moves down river, and enters the Columbia River estuary, in the vacinity of Astoria, Oregon from June through September. The typically ocean type fall chinook spends its second, third, and sometimes fourth, winters of life in the ocean and returns to spawn on its fourth or fifth birthday. The stream and lake types of salmon have the same basic life cycle, except that the second winter of life is spent in stream or lake, respectively. Coho salmon, the spring race of chinook salmon, and steelhead are all stream types, while sockeye salmon are lake types. 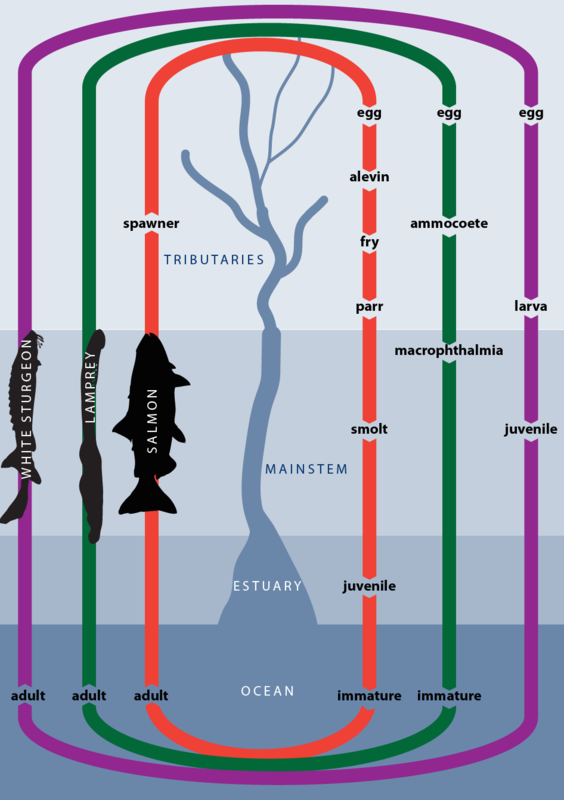 As is the case with any teaching model, this simplified life history explanation cannot capture the rich diversity of ages and types which are present in most healthy salmon populations. For example, some chinook populations may have both stream and ocean types within the same race. But the basic concept is that most biological species (e.g chinook, coho, sockeye, chum, steelhead) exhibit a diversity of strategies which allow them to adapt to different biological and physical circumstances, and these strategies are shared across species. Life history strategies of salmon are also identified by the season of the year in which the adults return to freshwater on their way to the spawning grounds. Prior to the entry of western culture in the early 19th century, adult salmon were likely to have entered the Columbia during all seasons of the year. It is probable that human development, in conjunction with harvest, acted to reduce the number of life history types of salmon in the Columbia River Basin; hence, there are now times of the year when practically no adult salmon can be found in the mainstem Columbia River. Salmon once occupied nearly 13,000 miles of Columbia River Basin streams and rivers. According to conservative estimates, the Columbia River Basin, both above and below Bonneville Dam, once produced between 10 and 16 million salmon annually (NPPC 1986). Historically, salmon runs in the Columbia River Basin consisted of 16% fall chinook, 12% spring chinook, 30% summer chinook, 11% coho, 23% sockeye, 8% steelhead, and less than 1% chum. These runs extended from March through October generally (Figure 3.4), though steelhead runs extended through the winter. Tributary habitat for salmon must be available for adult migration from the ocean, as well as holding, spawning, egg incubation, juvenile rearing and overwintering, and smolt migration to the ocean. Salmon, in general, spawn in gravel beds in rivers, streams, or lake shores in late summer and early winter. Watersheds tributary to the mainstem Columbia and Snake rivers are the primary nursery and rearing areas. Juvenile fish production is a function of the quantity and quality of available habitat. Factors that contribute to high-quality salmon habitat include: well-oxygenated cold water; spawning and rearing areas with low levels of surface fine sediments in the stream bed; abundant amounts of large woody debris in the channel; frequent large pools greater than 1 meter in depth; off-channel aquatic habitats fed by groundwater; stable stream beds; banks that overhang stream margins; and natural levels and types of riparian vegetation occupying the floodplain area. eggs through the winter months. As juveniles hatch, emerge from the gravel, and grow, they use a succession of habitat types, but prefer areas with both protective cover and access to a reliable food supply. Intact adjacent wetlands and subsurface aquifers cool and maintain flows during hot summer periods of reduced rainfall. Undisturbed floodplains with numerous side channels expand the amount of available rearing area and provide shelter during cold winter months. Mainstem Columbia and Snake rivers provide critical adult holding, spawning, incubation, juvenile rearing habitat, and are migration corridors for adults and juveniles. Over time, the Columbia basin streamflow has largely defined freshwater salmon productivity and has a major influence on ocean survival, which is largely dictated by the quantity and quality of smolts that enter and mature to adults in the ocean. Successful completion of each salmon life stage within the mainstem is dependent on critical physical and chemical habitat factors, including hydrological regimes driven by routine meteorological sequences, maintenance of hydraulic geometry factors, and continual organic and inorganic nutrient cycling (Hynes 1970; Heede and Rinne 1990). Specific requirements include temperature ranges from 7.2-15.6°C (EPA et al. 1971), dissolved oxygen normally saturated at levels greater than 7 mg/l (Reiser and Bjornn 1979), turbidity ranges from 10-25 nephelometric units (Lloyd 1987) and nitrate-nitrogen ranges from 0.02-0.03 mg/l. Also critical for different life stages are diversity in river velocities, which range from 15-100 cm/s, and diversity in substrate size and river depth (Groot and Margolis 1991). Large, small, and particulate organic matter provide structure and diversity to channel morphology (Maser et al. 1988). Large debris traps organic and inorganic sediment, which provide habitat diversity for salmon and niches for primary and secondary producers (Lisle 1986). In order for salmon populations to proliferate, diversity in secondary production is important. Rearing salmon depend upon different populations of macroinvertebrates at different times (Waters 1969) and drift insects provide high levels of nutrient levels necessary for successful growth and migration. Estuary residence is crucial for rearing juvenile salmonids and for adults preparing to migrate upstream (Healey 1982; McDonald et al. 1987; Wissmar and Simenstad 1988). Juvenile salmon spend days or weeks in the estuary acclimating to increasing concentrations of salt and adjusting to new food supplies. During this period they use aquatic vegetation and channel structures as cover from predators. Adults use estuary areas to readjust their body chemistry to a freshwater environment. An area of marine waters off the mouth of the estuary has been identified as an important transition habitat used by juveniles before they migrate further into the ocean (adjacent Figure 3.2). All free-ranging anadromous fish use the ocean as a feeding ground, where they grow to maturity. The ocean habitat provides feeding opportunities and conditions necessary for salmon to attain adulthood. Salmon are generally distributed over the northern Pacific Ocean and Bering Sea (some populations or subpopulations remain in coastal waters or freshwater), where they stay for 1-7 years until they mature. Growth and mortality rates for populations caught in ocean fisheries (e.g., fall chinook and coho) are reasonably well known (Groot and Margolis 1991). Less is known, however, about spring chinook, sockeye, and steelhead. Pacific lamprey or “eel” are restricted in North America to the Pacific Coast and coastal islands from the Aleutians to Baja, California. Pacific lamprey were once widely distributed throughout the Columbia Basin in Oregon, Washington, and Idaho (Kan 1975; Wydoski and Whitney 1979). Distribution was likely a function of access to suitable spawning and rearing areas (Kan 1975). Size estimates of predevelopment populations of Pacific lamprey are not available, but some counts at Bonneville Dam have exceeded 300,000 lamprey annually (Starke and Dalen 1995). These counts include only those fish that passed the counting station during the 18 hours of counting, i.e., they do not include lamprey that passed through navigation locks or at night. Night time passage can be equal to or greater than the numbers migrating during daylight hours. Data from the commercial harvest of Pacific lamprey at Willamette Falls indicate that 116.6 tons on average were harvested from 1943 to 1949 (Mattson 1949). An indication of predevelopment abundance of Pacific lamprey in the Snake River Basin is reflected in the name of the ancestral Nez Perce village, Hasotino, (near present day Asotin Creek) which means “the great eel fishery” (Spiden 1908). The life cycle of Pacific lamprey is similar to that of salmonids (Figure 3.2). Although they reach the spawning grounds in mid-summer (Kan 1975; Beamish 1980), Pacific lamprey generally spawn the following spring. Thus, adult lamprey spend approximately 1 year in freshwater. Spawning generally occurs in small tributary streams, where both sexes construct a crude redd (Scott and Crossman 1973), generally located in the center of the stream near the tailout of a pool, and immediately upstream of shoreline depositional areas (Beamish 1980). Mating is repeated several times in the redd, with each mating followed by actions that move substrate over newly laid eggs. Water temperatures of 10-15oC have been measured in Clear Creek, a tributary of the John Day River, during spawning (Kan 1975). Adults die soon afterward and provide valuable nutrients to small tributaries where salmon fry rear (Kan 1975). Eggs typically hatch into ammocoetes in less than 2 weeks; these newly hatched larvae, which are filter feeders, then drift downstream and bury themselves in silt, mud, or fine gravel along the margins and backwaters of streams and rivers (Scott and Crossman 1973; Hammond 1979). Ammocoetes generally spend 5-6 years in freshwater (Scott and Crossman 1973). In the fall of their last year, they metamorphose into macrophthalmia, which resemble the adult form. This transformation process is generally completed by early winter. Downstream migration of macrophthalmia appears to be stimulated by and dependent on late winter and early spring floods (Hammond 1979). Because they are not strong swimmers, lamprey appear to be dependent on spring flows to carry them to the ocean (Kan 1975; Beamish 1980). The upstream, spawning migration of adults generally begins in early spring. Adult lamprey use the mainstem in returning to their spawning grounds, but do not feed during this period. They were once an important food source for juvenile and adult sturgeon in the mainstem (Kan 1975). Pacific lamprey appear to travel directly into the open ocean, rather than feed in the estuary of nearby coastal waters (Kan 1975; Beamish 1980), as do some other lamprey species. Pacific lamprey rear in the ocean habitat for up to 3.5 years (Beamish 1980), and range in excess of 100 km offshore, often in areas of considerable depth (up to 800 m) (Kan 1975; Beamish 1980; Figure 3.2). Adult lamprey in the ocean are parasitic on many fish species, including salmon. They attach themselves to fish and other animals and feed on blood and body fluids through a hole rasped in the flesh of the host. Figure 3.2. Life cycles of salmonids, Pacific lamprey, and white sturgeon in the Columbia River Basin. White sturgeon above Bonneville Dam are no longer anadromous. White sturgeon (Acipenser transmontanus) are a large, long-lived species, commonly reaching 70 years of age and weighing in excess of 1,000 pounds (Bajkov 1949; Scott and Crossman 1973; Beamesderfer et al. 1995). Today the only population in the Columbia Basin that migrates to the ocean is downstream from Bonneville Dam (adjacent Figure 3.2). Dams have effectively trapped and separated the historical single population of white sturgeon into a number of separate reservoir populations, and thus created a number of functionally isolated nonanadromous populations upstream from Bonneville Dam (North et al. 1993). Remaining populations are thus considered to be landlocked or resident in the reservoirs upstream from Bonneville. They do not migrate to the ocean. Rather, they complete their life cycle in the mainstem Columbia and Snake rivers. Historically abundant populations of white sturgeon occupied the Columbia Basin, and millions of pounds were harvested commercially during the turn of the century (Craig and Hacker 1940; Galbreath 1985). Prior to hydroelectric development white sturgeon were semi-anadromous throughout much of the Columbia and Snake river basins, with the exception of the geographically isolated Kootenai River population (Northcote 1973). White sturgeon spawn in areas of high water velocities (greater than 0.8 m/s) over areas of bedrock, rubble, and large boulders (Parsley et al. 1993). Historical spawning areas were probably located at the downstream end of falls, cascades, and rapids. Today these conditions are met in the tailrace areas immediately downstream from hydroelectric dams. Sturgeon begin spawning when water temperatures are 10-18oC, with optimal temperatures between 13 and 15oC. White sturgeon are broadcast spawners, and probably spawn in small groups consisting of a single female and several males. Newly laid eggs are extremely adhesive, and drift to the river bottom where they adhere to bottom substrates. Hatching generally occurs within 7-12 days (Miller and Beckman 1993). Eggs can be killed if temperatures rise above 18oC. Newly hatched white sturgeon have an internal yolk sac. These yolk sac larvae disperse by swimming vertically into the current and drifting downstream. The larvae metamorphose within a 25- to 30-day period, after which they grow rapidly. Females require an average of 23 years before they spawn, with males maturing earlier. These fish continue to grow throughout their life cycles. Although reservoir populations do not have access to the Columbia River Estuary, the estuary is an important rearing area for juvenile and adult white sturgeon downstream from Bonneville Dam (DeVore et al. 1995). The estuary provides access to the ocean, other drainages, and a variety of seasonally abundant prey. In addition, the estuary facilitated restoration of white sturgeon after commercial fisheries decimated populations at the turn of the century (McCabe and Tracy 1993; DeVore et al. 1995). Salinities greater than 16 parts per thousand are known to be lethal to larvae and fry (Brannon et al. 1985). White sturgeon use the ocean for rearing and as a migration route to other drainages along the Pacific Coast (Scott and Crossman 1973; DeVore and Grimes 1993). White sturgeon residing in the ocean have been found to be in superior condition relative to those in the estuary or freshwater (DeVore and Grimes 1993).